Who says you cant grow hydroponic crops anywhere? How about in the Antarctic, the coldest harshest continent on the planet. The only continent that has such harsh conditions there are no permanent human residents on the entire continent. The only residents are 1,000 to 5,000 people that reside throughout the year at research stations scattered across Antarctica. Out of all the dozens of research stations, only three are permanently manned year round, and they rotate the personal during the summer season. Well if you can grow hydroponic crops in that type of environment, you can grow hydroponically anywhere. The National Science Foundation’s Office of Polar Programs (NSF/OPP) oversees all of the research stations in Antarctica. 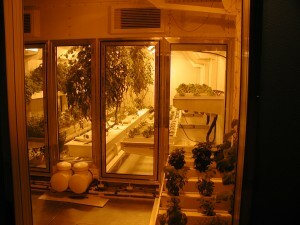 Many of the research stations have built greenhouses to grow fresh produce to feed the crews manning the stations. This is especially important for the few research stations that are in operation year round. Supply’s cant be flown in because like the north pole, most of Antarctica is in total darkness for about 4 months of the year. That combined with bad weather conditions like record lows of -117 F (without the wind chill), and unpredictable blizzard like winds, makes it extremely risky for planes to land and take off to bring in supply’s most of the year. So these stations simply can’t be re-supplied over winter months. All material and personnel must be flown in and stockpiled during the Summer season. Once the supply planes stop after the Summer season, the fresh produce quickly runs out. So if there going to have any fresh fruits and vegetables during these long cold months, they simply need to grow it all on site at the research station themselves. The availability of fresh fruits and vegetables for meals, as well as flowers in the dining and recreation areas, has a great effect and impact, to the overall morale of all the personnel during those long dark winter months. Hydroponics in Antarctica is not exactly new, they have been using hydroponic systems in Antarctica scene the 1980’s. Although it was not intended as part of the research, but just to help provide fresh perishable fruits and vegetables to the researchers, in order to make life at the research stations more bearable. 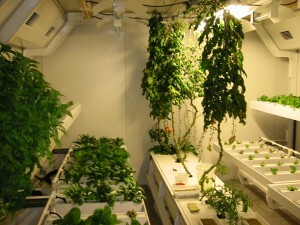 Though over the years, and through trial and error from the personnel at the research stations, as well as their persistence, they have been able to make hydroponics on Antarctica quite productive. Providing as much as 250 plus pounds of food monthly with less than 700 square feet of greenhouse space. The Antarctic greenhouse at the McMurdo (US) research station is not your ordinary greenhouse though. With the help of the researchers in Antarctica, the University of Arizona’s “Controlled Environment Agriculture center” has developed the most sophisticated state-of-the-art growth chamber (greenhouse) on the planet. It’s also a prototype for space stations, including those future stations planed for the Moon, and Mars. 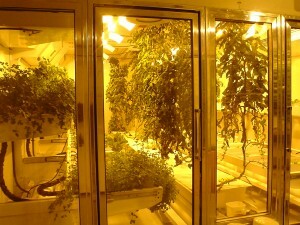 It’s called the “South Pole Food Growth Chamber” (SPFGC) Project. The Growth Chamber was first completed and delivered to the South Pole McMurdo research station in February of 2004. It’s a completely sealed, automated atmospheric, CO2 enriched, climate controlled greenhouse. This includes recalculating the waste heat given off by the water-jacketed HPS lamps to supplement the heat needed to heat the greenhouse. 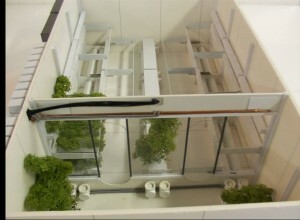 Also the hydroponic nutrient delivery system, and pH adjusting system, as well as all the environmental conditions are computer controlled by the ARGUS agricultural environmental control system and equipment. It records, controls and displays all key aspects of the environmental conditions for current, and later analysis. The Growth Chamber is fully operated by volunteer’s at the research station, and with each personnel change the new personnel needs to be trained to operate it all. 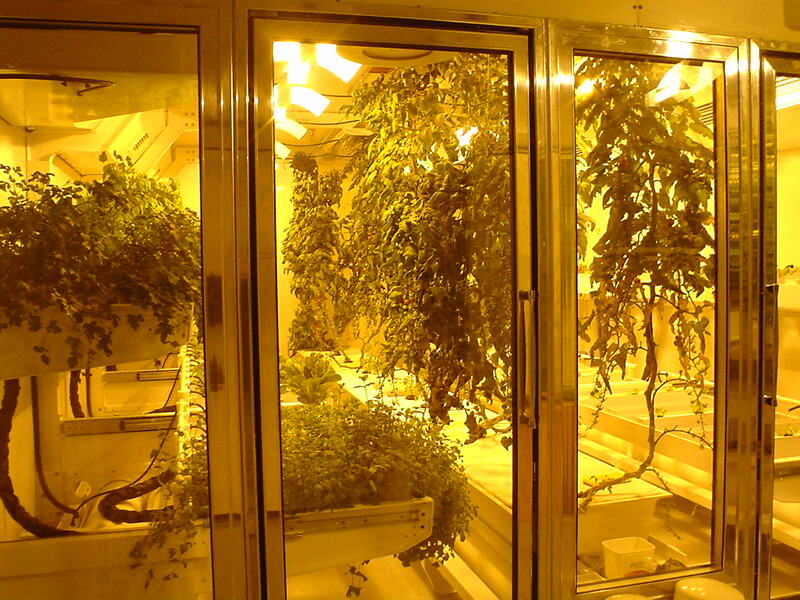 Some of the typical hydroponics crops grown in the Antarctic include tomatoes, lettuces, spinach, various dark leafy greens, cucumbers, bell and hot peppers, beans, zucchini, snow peas, fennel, as well as all kinds of herbs. Growing hydroponically allows the grower to grow out of season crops as well as all year round, and with the fully climate controlled greenhouse it’s always the perfect season for the plants. By using this to their advantage, that allows the personnel in Antarctic to continually rotate the plants so they always have fresh ready to eat produce from there crops. Also by germinating seedlings on a regular basis, they make sure they always have replacement plants ready to place in the hydroponic systems once they have harvested the older ones. This significantly reduces the time that’s needed to go from seeds to maturity (or before they begin to fruit), and helps to make sure they have a continuous supply of fresh produce all the time. Well perhaps ordering your own “South Pole Food Growth Chamber (SPFGC)” is out of the question, but it just goes to show that just about anything can be done. Not many of us have such extreme conditions to deal with, but all it takes is some trial and error, persistence, patients, and ingenuity to find a way to solve any conditions and/or problems that you may be facing with your hydroponic gardens.